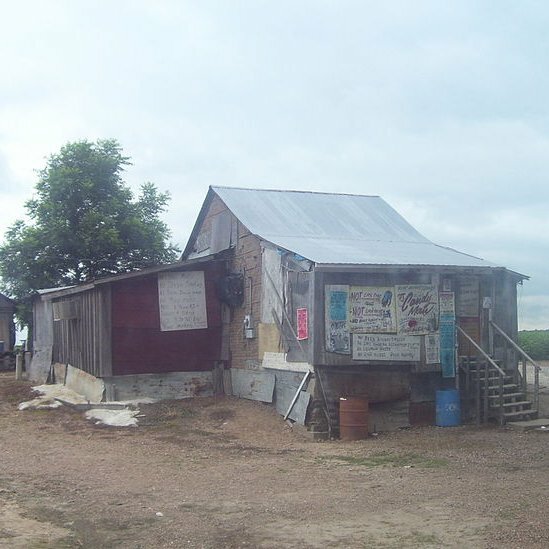 Po Monkey's Juke Joint in Clarksdale, MS. Picture source: Wikipedia. Today's playlist comes from a CD set from about 2005, titled Jook Joint. And that title inspired me to tell some more about the small, informal cafes in ramshackle dwellings that once were numerous in the rural communities in the Deep South. The juke joint served African American rural workers and blues singers travelled from one to another to earn some money for the day. Most of these places have vanished and the few remaining attract tourists in rental cars and blues pilgrims rather than impoverished cotton pickers washing their troubles away with a bottle of moonshine. The delta blues sang of the hardships of Southern African American field labourers in the after-slavery Jim Crow society, and it's a good thing these days are gone forever. And I'll keep on playing African American music from the thirties to the fifties, not for nostalgia for a time that wasn't better, but simply because it's such great music.